Dublin City wedding photographer - Christine and Kate's Drury Buildings wedding. This day last year Christine and Kate got wed! Happy anniversary girls. During busy seasons I don't get to blog very much and I don't get to share some of my favorite weddings. I am so glad that I decided to revisit this wedding. It's wonderful to sit down a look back over this gorgeous day. The girls chose some of the coolest venues in town, they both looked gorgeous but the thing that stands out most is the mood. There was so much love and excitement, tons of happy tears and sincere and tender hugs. Christine had tears in her eyes has Kate came down the aisle and giggles were aplenty. The ceremony was a simple but intimate affair at The Registry office. Only the closet family and friends were present. It rained on arrival and as we left but that didn't dampen matters. On a plus side, it encouraged us to pop into Cafe En seine for a sneaky pint until the showers passed. I quick gaunt around town taking in St Stephens green, some side street and some nice shop front bought us to The Drury Buildings. This is one of the best bits of the day. All of the girl's guests had already started the celebrations on the top floor of the Drury building, all that was missing was the new Mrs and Mrs. Their entrance was just magic, Cheers, whistles and a thousand hugs and kisses followed. It was amazing. There was a couple of hours of eating, drinking, chatting and cool jazz piano followed by dinner in Fallon and Byrne. Village at Lyons wedding photographer - Valentines day romance with Martin and Seamus. An intimate and stylish affair. This was my first wedding of 2019 and what a way to start the year. I just loved working with Seamus and Martin. Not only did they have their wedding in the beautiful Village at Lyons but they had peacock featured dickie bows, bowler hats and two of the cutest dogs that I have ever seen. So many colorful, fun and unique details, I was in my element. The boys got ready together in The Mayor's house beside the lake. It really was so romantic. They were excited, nervous and giddy. We had a photo shoot before the ceremony which was so much fun and great for shaking off any nerves. The boys chose to have a small wedding with only their closest friends and family. It really worked. Seamus and Martin made every single person there feel special and included this created such a warm atmosphere and also meant that everyone fitted beautifully into The Orangery. This glass house is one of the most beautiful spaces to get married in Ireland, I just love it. The ceremony was filled with lots of giggles and romance. Their two pug dogs made a surprise appearance as ring bearers which had everyone in stitches. The vows were tear-jerking, it was all gorgeous. The rest of the day was super relaxed and the guests were well and truly spoiled by the grandeur of the setting. One long banquet table was set in The Mill. It was grand and elegant yet still intimate and fun. They made an amazing entrance to a huge round off applause. I left as the food arrived but I got the feeling that this was going to be an incredible party. Seamus and Martin - From the very get-go I knew we were a great match. Thanks so much for having me. It was cracking. The Cliff at Lyons Wedding photographer - Amazing Craic with Joeleine and Jon. Some people just have amazing style. When stylish people also know how to have amazing craic you know you are at a brilliant wedding. These two got married in the depths of winter at The Village at Lyons. They cleverly chose to have a first look to avail of the lovely winter light and to get the portraits out of the way so that the fun could keep rolling once it started. It was a small intimate wedding with half of the guests coming from the UK. Jon is English and Joeleine was keen to show the guests some good old Irish craic. Joeleine is an ace Irish dance and hatched an incredible plan. As soon as the ceremony ended all of the guests were bought back to a cottage for a Ceile. Trad musician played, fires roared and brushes were jumped over. Professional dancer showed everyone the steps, the dancing began and the craic was mighty. After a brief interlude with some sparklers the guests returned to the beautifully set Orangery for some fun speeches and a cosy meal in the most exquisite setting. Joeleine and Jon turned a traditional wedding on its head, making the day work for them. They broke all the rules and it totally paid off. I love working with fearless couples who totally own their day. 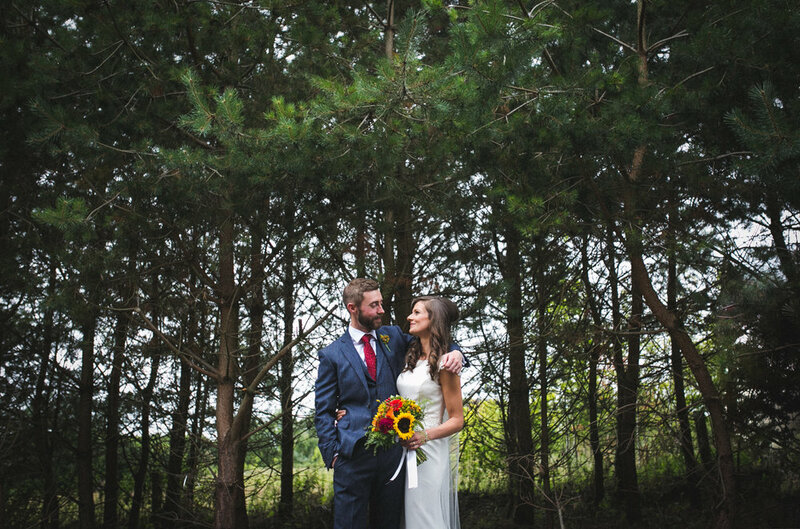 Brooklodge wedding photographer - A beautiful autumn day for Sam and Niamh. It was so cold but so beautiful. Brooklodge on an autumn day can’t be beat. Niamh and Sam were a dream to work with. They were both so relaxed and so in love, they radiated. Ciara and Neal's elegant Black Tie wedding. In a marquee at home in the garden. Dublin wedding. There so many things that I loved about being the photographer for this wedding, I don’t really know where to begin. I met Ciara when I photographed her sisters wedding a couple of years ago. These girls have style, grace and great taste. They and their family made me feel right at home and I just loved being around such a calm, wonderful and loving family. When Ciara asked me to take her photographs at her home I was thrilled. I couldn’t wait to see everyone again. When I arrived the autumn light was gloriously shining over their beautiful garden, the marquee was being prepared and it was all hands on deck. There garden were full of flowers that Ciara’s mum had grown especially for the day and she was busy pruning and collecting petals. Tables were being carried on heads, cakes were being dressed and cats were hiding in green houses. It was calm and blissful. Ciara’s dress is out of this world and Neal looked bob smacked. The ceremony was bursting with laughter and love. It was so great to see all the familiar faces back together to celebrate another beautiful day together. Having a wedding reception in your garden in October is risky but their risk paid off. Drinks were drank on the terrace surrounded by autumn colour and fantastic evening sunlight. The craic was great. There is something about having a wedding at home that makes everyone feel so relaxed, the atmosphere was great. The marquee felt like being in a grand hotel, it was perfect. The speeches were side splitting and tear jerking, the best kind of speeches. When I left the place was buzzing, dinner was being served and Ciara and Neal looked blissfully happy. My only regret is that all of Ciara’s siblings are now married! Mount Druid wedding photographer - Dan and Ana's fun filled day. If I could work in Mount Druid every week,I would! Every time I go back there is something completely new, creative and wonderful to work with. This time there was an old double decker bus that had been converted into an apartment. Where else but Mount Druid would you find this. It takes a particular type of couple to get married in Mount Druid and an even more special couple to choose to sleep on a bus on there first night as a married couple. What I am trying to say is that Mount Druid couples are very chilled out and Dan and Ana were no exception this. It was also beautifully fitting that their romance first blossomed on the bus to UCD. Dan and Ana’s day was filled with colour, fun and moments of pure magic. Their friends played the ceremony music, this is not uncommon. However when these friends write a song for and about the couple and all the guests join in at the chorus, oh my my goodness! Pure magic. Their day was peppered with so many quirky and beautiful moments, I just loved being there and capturing it all. Thanks so much to Dan and Ana for having me, I had a ball.